Tanya DePass is the founder and Director of I Need Diverse Games, a lifelong Chicagoan, founder and Editor In Chief of the Fresh Out of Tokens podcast and she’s also the Diversity Liaison for GaymerX. Alexandra Orlando: I’m here with Tanya DePass and we are going to be chatting a bit and I have some questions I’m really excited to ask. Thank you for deciding to chat with me. I know you’re always pretty busy and just got back from a whole bunch of travelling so I was excited to see that you responded so quickly and that we can chat. Tanya DePass: Oh, I’m totally happy to chat with you. AO: So I thought I’d ask the origin story question. 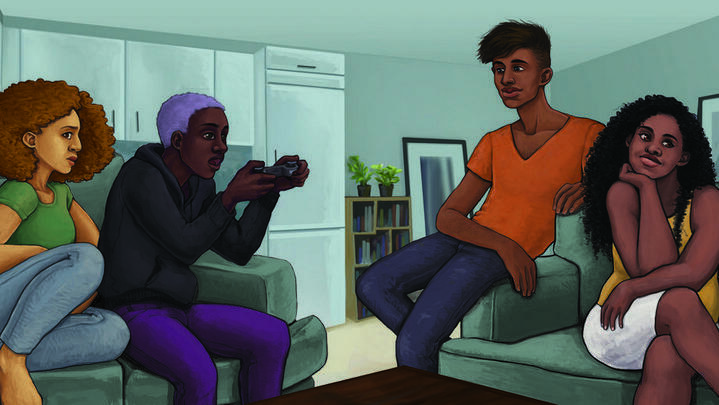 How did you get started doing all this: INeedDiverseGames, activist work in games. TD: So it’s kind of a funny story. I literally was mad about games at six in the morning, almost three years ago now. It was around the time when the whole, “Oh it’s too hard to animate women” and we were inches from playable female characters; things were going on. And I had that moment of “Really, are you serious? This is where we are at?” And, you know, tweeted and threw out the hashtag #INeedDiverseGames, along with some rather salty tweets about that, and, you know, it picked up steam. It was around the time a lot of discourse was happening about diversity and the need to do better, and a lot of hateful people were also trying to have their say in the industry. So it was the right place right time, along with friends who had a much larger social media presence sharing those tweets, and developers sharing those tweets. And then it just kind of ballooned out into a community, a Tumblr blog, and then its own more professional space to have these conversations, and then eventually a podcast, and now we are a nonprofit. So it’s been a very quick evolution from angry hashtag tweet about a serious issue into an actual nonprofit. AO: Yeah, and that nonprofit news–I remember you announcing it. It’s almost a year now I think, right? TD: In August it’ll be a year. AO: Okay, so I just feel like I just want summer to happen right now and then it’s a year. But yeah, and that was huge and very exciting, and kind of just shows you the power of how, you know, Twitter can move things very quickly. Like, we often say Twitter’s a horrible place where bad things happen all the time, but, like, this is the best success story to come out of Twitter, one of them, you know, based on a few tweets and how mobile a message can become. TD: Definitely, because you know we’ve seen #WeNeedDiverseBooks do the same thing, and a few other hashtags. #Blackout is now, I don’t know if they’re a nonprofit or anything but, you know, the whole blackout movement is now recognized by a lot of people and finally getting the coverage it deserves. A lot of good things do come out of Twitter. Despite the very toxic side of it that many of us get to experience it can be a tool for good. AO: Yeah, for sure. And to kind of I guess contextualize the conversation within the First Person Scholar space, we often are sort of towing the line between activist work and scholarship work, and there’s many figures in our industry, such as T.L. Taylor, and Katherine Cross, and Kishona Grey, who are doing activist work in the games industry, and are people who we admire at First Person Scholar. But there’s often this tension in the academy between work that goes on a CV or work that, you know, contributes to tenure when you’re a professor, and activist work, which is something that I’ve been personally told is only something you’re supposed to do when you’re an established scholar. It’s kind of the end goal in your career when, you know, you’ve done your publications and you’ve done your time in the classroom, and then you go out in the world and work with organizations. [So I thought a] good question to ask you is, how can we, in game studies, work with activists in the games industry, with people like yourself? TD: Well I think it’s a multifaceted issue, because, you know, activism can’t sit and wait for someone to get tenure. Activism and speaking out cannot wait for someone to be safe and comfortable all the time. So I think a lot of it has to do with collaboration and speaking to people where you see everyone being outspoken about issues, but also going “I study this.” What can I do to kind of give you that academic, factual backing? Not that activism isn’t factual, but, you know, kind of what data, what meat can I give your argument that will help both of us? Because the activist is out there on the front lines, kind of doing things that maybe an academic doesn’t have access to, doesn’t have time for, or maybe if they are trying to do tenure, because I know that’s a very fraught process, may not be in a position to do and be so forthright and so out there. But I think it’s a matter of collaboration, because I know all the people that you’ve named. I’ve met many academics that are out there being very, you know, front and centre with what they’re talking about in games, but I think there needs to be a bit more discussion, not just “I’m an academic. This is what I do. I deal in facts and figures and I teach,” etc. And it just seems very siloed to a lot of people because they see an activist and they have a very, I guess, kind of set idea of what an activist is and what an activist does in terms of, you know, speaking out about diversity, speaking out about, you know, sexism, and other issues in the industry, versus they may see an academic as taking a very measured stance, a very measured tone, doing things in a very, you know, academic, research-based manner, which can be very slow. And granted, it can be slow, but everything has its place, but I think there needs to be more discussion and more realization of what activism can entail. Activism can entail academic research, because you’re giving that empirical data, you’re giving that information to activists and to us doing the work; you’re giving it a backbone for the argument. And there is a place for data to make the case for diversity; there is a place for academic research to be that backbone to what activists are going out and doing, and I think if there was more collaboration it could go a lot further. AO: Yeah, those are really, really great points, and especially, like, resounding is when you say activism can’t wait for tenure. And that is very indicative of the academy; everything is just slow. Academic publishing is slow, becoming a professor is a very slow process, you know, a PhD nowadays takes four to five years on average, not including the fact that you need your undergraduate before that and a Masters, and all these publications on the side that you have to wait for. And so us, at First Person Scholar, we do try and speed up that process by publishing things in a timely manner. So, you know, we can get timely issues out on the web, and we can get people publishing faster than an academic journal where, you know, they may, after you submit your article you may not even be accepted, or they change it to the point where it’s not what you’re even trying to say anymore, things like that. So yeah, the speed is definitely a huge issue, and I wonder if we sort of see the same thing in the games industry as well. You can probably speak a little bit more to that than I can, but just this idea that, like, you know, the industry responds seemingly very slowly, or very measured, to, you know, GamerGate, and diversity issues, and is it trendy anymore to talk about diversity in games, that sort of thing. AO: Yeah, that grade-school analogy is perfect. Again, this is kind of timely, but I watched the Power Rangers marathon a little bit, and they had that food festival episode where it was like, literally “Asian,” and I think the sign cut off but it said something like Jamaican-American, and then just regular American, and those were like the three groups of food that you could get, and I was just like, “That’s the games industry right there,” right? It’s like, alright children, let’s try food and then be accepting of other cultures and things like that; it’s too funny, but so perfect. That analogy is so very much needed when, you know, we’re trying to measure what these huge corporations are trying to do. And speaking of industry, so we mentioned before you just got back from both GDC and PAX East, which I was saying for those that did both, like, what a whirlwind. Because normally I think PAX East is a little later; isn’t it in April normally? TD: Yeah it’s normally in April but this year they were just totally back-to-back and Emerald City Comicon overlapped GDC. AO: Oh, Jesus, yeah, that’s another one. So I’m very curious to hear about your experiences at these conventions: maybe some success stories, or just of the overall reception of #INeedDiverseGames in these spaces. What kind of conversations can you have at conventions, and that sort of thing? TD: Yeah, and it was just like, I was close enough to the stage where one of the panelists did catch the look on my face, and I’m pretty sure I made like a very unhappy growly noise under my breath. But it’s just like, that is a noble concept but in reality it does not work. But, you know, having these conversations, both good and bad, were good because, you know, GDC is a place where you have access to a lot of people. There’s folks that you can talk to that are either part of diversity things at their studio or hopefully they can go and take them back to their studio and you can have fruitful discussions afterward when everyone is not exhausted after a week of professional development. PAX East was good, we had a table and diversity lounge, which is good, both good and bad because again that problem of “diversity lounge!” but mostly white-led organizations. And it’s just like, it’s an access issue, because the people that need to be there may or may not have access to spending on the flight and hotel. And there’s no cost at the table–of course we did exhibit our badges for it–but you need things to have on your table. You need some kind of marketing. So there is a cost associated with going. TD: And East is shorter than West. You know, East is three days, but you know, you have to get there a day early to set up, you have to stay until the very end so that usually means staying another night in a hotel, and there are just many things where it’s like, you know, this is wonderful in concept. In proof it could do better. There were a lot more people of colour there and people of colour-led orgs, but again the diversity lounge cannot just be the few queer white people and other folks that have the means to get there, which is not everyone. AO: Yeah, and so jumping back to something you said, when you confront people about “Hey this isn’t working,” what’s their response typically? Like, what is the excuse? TD: I mean, the number one thing I get is “I just didn’t think about it.” You know, or a lot of it is, “These people are known, so we’re going to have them.” Or, you know, the thing that people don’t like to talk about is white people listen to other white people. And, you know, there are plenty of people who have made a career out of being the woke white person or the person talking about diversity issues, and they get the pat on the back, and they get, you know, lauded for being so aware, and so conscious, and they’re the one that always gets invited to conferences and to speak or to be on these panels and it’s like, “This isn’t your experience.” Because yes, it’s great that you are aware of these things, you’re aware of your privilege, and the racist society we are all raised in, but you are not a person of colour. Even if you are a queer person, there is intersections to being a person of colour and queer, or a person of colour and transgender, or someone who’s non-binary, or someone who has any other issues and if you added things like mental health issues. You know, there’s so many strata to marginalization that the one awoke, aware white person can’t be the be-all end-all person to get for these panels because it’s safe. What’s interesting is that Susan Arendt of takethis.org had a great panel about the hate that happens in the industry and in our hobby as geeks. And I talked to her because she and I have conversed quite a bit, and I said, you know, “Your panel was great, but it was very white.” And she’s like, “That was actually on purpose, because one, I didn’t want to put a target on anyone’s back, and two, white people will listen to other white people,” because it was her and three white dudes. And I was like, “Huh.” You know, but in her case it was intentional to spare other people, and I can respect that because she was thinking about the person of colour who may be on this panel and then get harassed after. But a lot of people just simply don’t think about it, or they just go “Well, you know, I’ve had good conversations, and, you know, we’re talking about this.” Or they just go, “Well I don’t know any people of colour to ask,” or it’s like, well, go on Twitter. Ask people. Ask your friends. I’m sure your friends could know some other person you could have asked to be on this panel besides you. And people don’t turn down speaking opportunities. You know, if you’re a white person, even if you have an access marginalization, you cannot be the person that’s always out there talking about these issues because that is your perspective. And if you notice the whole panel’s a bunch of other white people, possibly those without a marginalization, maybe you should say something. AO: Yeah, or maybe you shouldn’t be the one to decide when people of color should be targets or not, or, you know, put themselves out there or not. So it’s like, yeah, many people of colour are already speaking about this type of stuff, and are aware that they may get harassed by doing it, but they’ve gone into this space knowing that and it’s not necessarily your job to decide when you’re a target or when you’re not, right? AO: Mmmhmm, yeah, and it’s so important just to, like, get people out there. It’s just, like, there’s so many people that can’t make it to these cons and for the people that can, like, use them as much as possible. Like, get them up there speaking. It’s just crazy that this is still happening and it’s kind of the same thing in the academy, like when we have conferences which I guess is like the conventions of academia, but way less fun; still kind of fun. But, you know, you have these conversations, and, you know, certain people are all rawr rawr about the industry, and making sure we’re more diverse, and blah blah blah, and then, you know, everyone goes home after the weekend and continues to their respective institution, and things go along as normal. You know, it’s so infuriating when I go to conferences to see people stand up and talk about things, and then, you know, the status quo just, you know, prevails throughout the rest of the year. And you have your, like, you know, June is when everyone decides to be an activist or speak up and then the rest of the year they’re, you know, sticking to their job, or you know, whatever the chair says in your department, you do. So we feel that frustration a little bit as well, definitely on our end. TD: Yeah, and there’s also the side of it where, let’s say your organization or your department doesn’t have someone diverted to diversity issues or something like that. A lot of times it will be given to the one person of colour or few people of colour in that department, in that division, but with the expectation that you’ll still do all of your other duties and maybe get to this too, and if you try to do anything like, you know, “I can’t really run an event on two hundred dollars for fifty people, have you considered a budget?” Or if they do have a diversity inclusion position, let’s say in a studio or something, or Twitter I’m looking at you, they will hire a white person. And it’s, you know, again, a white person with one access or maybe a couple of marginalizations, but not the ones that are not a majority. Because, you know, and this is not to be shady toward queer white folks, because I know someone who is quite cynical is going “Why is she picking on us?” But history will show, I mean, look at Twitter. For the diversity inclusion position they hired a white gay dude. I think he’s gay; if he’s not I apologize. But you know, it’s like, your D&I person is like everyone else in your company. That is not going to make me feel comfortable if I have an issue, if there’s microaggressions, if there’s harassment or racism going on to come to you, because you look like everyone else. AO: Right, yeah, exactly. The only thing I can do is just sigh and shake my head. It’s just, it’s too much. You know, and kind of along those lines, us talking about like just the constant, you know, battles and struggles, and, you know, oppression that you face, or not oppression, but like resistance at these type of events, you know, and you’ve been a little bit outspoken about that, you know, on Twitter, as far as like the overall cost of activist work that you know, diversity is a full-time job–diversity initiatives and that kind of thing. It’s not like the side project that you eventually get to. But basically, what needs to change in the industry to allow for your kind of work to be conducted without the high personal cost: you know, financial, physical, emotional? You know, it just seems like you shouldn’t have to be, like, taking so much of your own resources and time, and just constantly trying to confront these huge corporations, multi-million-dollar corporations about issues that, like, they just, you know, can’t put aside anymore. TD: Well the thing is, people have to actually care. They can’t do just lip-service. They can’t just do, “Oh, it’s women’s history month: let’s do a luncheon,” or “Let’s do this one thing and say we’re good for the month,” or have one lunch or one event or one outing for Black history month. They have to think about these issues, especially when they’re thinking about making video games, is you’re thinking about it from the ground up. You can’t create a problematic character, have a terrible trope-filed script, get to the point of all the art assets are done, everything’s done, then go, “Oh, someone should review this.” They should be thinking about these things from day zero. And, you know, be willing to bring in someone to review things if you don’t have a diverse studio. And, you know, I’m going to pick on one of my favourite franchises. I got a chance to play a little bit of Mass Effect: Andromeda because of EA Early Access, and this game has been five years in the making, and the hair options are terrible for natural hair. There’s one braided style I found for female Ryder, and the two quote-unquote “natural” hairstyles for male Ryders look terrible. It looks like someone unwound a steel wool pad. TD: Yeah. And this is a game in Frostbite. It is a beautiful game otherwise. But, you know, you’re basically forgetting that not all brown people look the same, and not that–that’s not correct. Because actually I could make a decent-looking Ryder, but these hair options, though. And this has been a fault that people pointed out with the last game that came out on Frostbite, which was Dragon Age: Inquisition, but even those options were better. Like, this is just shameful. And I know people are going to yell and say that I hate BioWare, that I hate Mass Effect. That is not true. What I hate is the fact that in 2017 we’re still having this conversation, and having a triple-A studio put out hair options that look like this. And, you know, one that is often held up as an industry standard, and as, you know, so diverse, so great, doing so well about diversity inclusion. There had to be someone brown, or the Internet, or something that could have done better than what I’ve seen in this game so far. TD: Or, you know, locks that don’t look like yarn. And, you know, I pointed this out on Twitter the other day, and there are games that are six, seven, eight, nine, ten years old, that have done a much better job. So you have a powerful engine like Frostbite, and yet this is what you give us. And so it’s very disappointing, and it’s things like that where it’s like, it’s a huge triple-A studio. And yes, it may be scary to take the risks on a consultant because you don’t know what will get out in the wild if you’re trying to keep this under wraps. But do you want that or do you want the backlash of people seeing this and going “What did you do? How did you get here?” And I say this–full disclosure, I am friends with many people who work at BioWare, some of which who worked on this game–but, you know, it is a giant company, and a giant studio with many people who worked on it, and you just have to wonder. Where was the person who spoke up? Did someone speak up? And were they–just weren’t listened to? You know, my question is always, how do you get here, especially in big studios, where you have to wonder, “Really? This is where we are?” How did you get here? AO: And it’s also, it seems to be like more crushing when it’s companies like BioWare because, you know, you said they are held up to that kind of higher standard in comparison to the rest of the studios. And there’s just, like, this–it’s kind of like a sense of hopelessness when this stuff happens, because you’re like, if the most, you know, quote “diverse” studio can’t get it right, like, how can we expect it of anybody else? It’s just one of those moments, and you just–what do you do? It’s not just one person, or it can’t just be one movement if, like, the higher-ups are the ones that are gonna be turning down any sort of suggestion or thought to it. AO: Yeah, and let’s get Tanya some access. All those game devs that listen to our podcast, I’m sure, get her access! God! And maybe this next question is going to touch on a bit of, like, what we’ve already discussed, but how do you deal with this notion of activist burnout? Because you were like, you’re saying the same things over and over again, and you know, your point is, yes, because nothing’s changed. But then there’s just people that are like, you know, sick of hearing the same things, or assume that the problem has been solved because we have, like, a few more white female leads in games over the last few years of that kind of thing. What’s your response to that? TD: It’s hard, because–so let’s say for instance GDC. You know, like, a whole week of, “Oh, I love what you do, I’m glad you’re doing what you do.” But then, you know, get back and realize that just a week of GDC has kind of burned through a lot of our resources, and a lot of people still don’t want to pay for diversity consulting, or they think that you should give this for free because it’s community service. And, you know, it’s a very weird kind of two-sides-of-one-coin, so people talk a good game, but then when it comes to actually supporting that with resources, the things people need to get the work done, suddenly it’s “Oh, well, we have limited funds,” or “We can give you merch,” or “We can do this,” and it’s like, you know, that’s great, but that doesn’t help buy a flight. It doesn’t mean that you have thought more about this, or, you know, you’re not willing to listen. Because even if you just do a Skype call and someone doesn’t fly you up, that’s still time you have to spend preparing; that’s still things like that. So with the burnout I just kind of, I take a step back. I often will just, like, you know, today’s not the day for emails, things like that. But also, just, it gets frustrating. And it seems to come in waves where it’s, you know, everybody wants to, you know, talk to you, or have an interview, or do whatever–and then quiet. And those quiet times where you have to sit back and think, “Is this worth it?” I have very recently and very often thought about, you know, I have made this my job. I have made this my work. But at what point is it no longer worth it? Because at some point, you have to wonder, where is the change happening? When am I going to see that change? And are people really listening? Because you can tell when someone is listening but not really listening to you. You know, that kind of “Uh-huh, yeah,” and they give you your card and you never hear from them. TD: So the burnout is very real, and then what happens is when people do take that step back and they go, “You know what? I can’t. I can’t do this,” either for emotional health, physical health, well-being, whatever. Then it’s, well, why aren’t you doing this? See, the industry’s pushed out someone else. Like, the industry didn’t really push someone out. There was no real response to, “I’m trying to do this work, I’m trying to make things better,” because it’s not about hating the industry. It’s not about hating games, which a lot of people want to conflate with criticism. It’s recognizing that the market has changed. The market that everyone has been told is, you know, eighteen-to-thirty-five year-old white dude, is not the case. And there’s so much pushback against it, it’s just at some point you hit that point of, “You know what? I’ve fought this fight, nothing has changed,” or changing so slowly that I’m tired of, you know, do I, you know, try to scrape together enough to keep the lights on, pay the rent, everything else, or do I, “You know what? I’ve done my time, and however many years, sometimes months, I don’t have the emotional fortitude for it.” Because, especially now, you’re dealing with not just, “I’m putting myself out there publicly to talk about these issues,” but you have people that think because you exist publically that you should be spoken to in a certain way, that you should be harassed and threatened. Or that, you know, because I am female, that clearly I must not know anything about games, and I’ve never touched a controller. And you know there’s always someone who will try to turn it into, “You’re the one causing problems, because how dare you talk about this. Games are strictly fun.” Or “Keep politics out of my games,” which is, like, one thing that sets me off, on edge, because everything is political. Everyone who’s touched this game has influenced it in some way. And that’s any game. And you can’t just have something strictly free of influence, strictly free of politics or personal preference. That just doesn’t exist. Objectivity is a lie. Everything is subjective, and how I view a game, how you would view a game, or anyone else, we–that burnout comes from, “Okay, I’ve tried. I’ve done everything I can do, I’ve been as nice as I can be, I’ve been as loud as I can be, and the needle still hasn’t moved.” And you go, “You know what? I’m done.” And I’ve thought about it. I’ve really thought about, is this worth it? Is it worth kind of putting everything I’ve got into this work and seeing the needle move maybe an inch in a few months. You know? AO: Yeah, and it’s completely legitimate to feel that way. And, you know, many have stepped back, and, because they need to think of themselves, too. Like, self-care, it’s like, “I have to live for, you know, the next–the rest of my life.” And, you know, this project, or this work that I do is not working. And, you know, it’s insane to think that it can all be on one person’s shoulders. And, you know, you have to live, or else none of it’s going to matter if you can’t keep the lights on, or pay the bills, or afford food, or whatever. So–and many of us in the academy, especially graduate students, like, go through that struggle too, where, you know, First Person Scholar, being involved in First Person Scholar, inevitably delays your degree. And by doing so means that after four years you run out of funding and you’re going on your own. Or, you know, you just are told you shouldn’t be doing this, you shouldn’t be doing that, or you need to focus on writing, or publishing here, or doing that. And so, like, many of us take that stance and, you know, we’re like, “Well, we’ll just delay it, and do important work that ultimately, you know, doesn’t affect our academic CVs in as many ways as maybe publishing in an academic journal does. But, you know, it’s a sacrifice, and it’s unfortunate that, like, their institutions don’t support that. You know, University of Waterloo is very much pro-HeForShe, and I’m sure a lot of professors signed that document and went about their way, and were like, “Yep. I’m ‘ForShe’!” And that’s, like, where most of the activism usually lands on the academic sphere. So it’s a struggle, and the people with the power and the means and the money and–maybe not necessarily the time–but, you know, aren’t doing the work that needs to be done. And it’s, you know, and then you move on, and after your degree, and then, maybe go into academia, maybe don’t, and all your time spent there could be considered, like, moot. Like, we don’t know. FPS might–we don’t know how long it’s gonna last. You have to–that’s totally up to whoever/whatever students decide to, you know, sacrifice their time and money to the project. AO: So, yeah, I feel you, I feel you. It’s–ugh–it’s a burnout here, too. But maybe shifting to something more positive, maybe less grim, because, you know, people say Canadians are very grim people. I don’t know. I guess because, like, we live in the cold and dark for so long. So I could go on and on about that. But, so we talked about a little bit about Twitter, and sort of the potential there, but what you’re also doing is focusing on Twitch. And so you stream on your personal channel and there’s also INeedDiverseGames’ channel. How have you been using Twitch streams to connect with both the INeedDiverseGames community and then the larger Twitch/gaming community? AO: Oh, that’s great. People are listening. So then, basically, when you’re dealing with, sort of, maybe less of the INeedDiverseGames, you know, the regular people that come into Twitch, how do you create that safe space? TD: Rules and moderators. On my personal Twitch, and on the INeedDiverseGames Twitch, we’ve got some basic rules and, you know, don’t act a certain way, there’s certain words that are not tolerated. You know, when we are streaming games we create extra banned words lists. Especially when streaming, like, Mafia 3, or Watch Dogs 2, which, having a Black protagonist, draws certain people which have nothing better to do with their day. You know, having people that are dedicated to what we talk about, what we do, what our mission is, and having them available, what we’re trying to do is get more people to stream on the channel. Especially with all the travel I’ve got coming up, so what we’ve been trying to do is highlight other streamers but also get people to stream actually on the channel. But since we’re not partnered we can’t create a team, and so there’s that whole thing. TD: No. Hopefully I can talk to someone. Like I said, after our panel, we did have a chance to talk to some of the UX and user research folks that work at Twitch, so we’ll see what happens. AO: Yeah, I hope, I’m crossing my fingers on that one. You often stream, you know, going back to BioWare, you know, Dragon Age, Mass Effect, BioWare games–what is it about those series that really connect with you? Or maybe the message of INeedDiverseGames? TD: I don’t know if it’s so much the message of INeedDiverseGames. I’ve always been a big BioWare fan, since Dragon Age: Origins. And with RPG games, especially ones that I have played so much, it’s easy to stream for me, because I can easily play the game and talk at the same time. But it’s also, you know, it’s story-driven, it’s narrative-driven, and there are things in, I think, narrative-driven games, that you can, not–pick apart’s not the right word–but you can dissect and talk about. Like, there’s this scene in The Witcher, and–slight spoiler, it’s early in the game–where you come across a dude where it turns out he has been exiled because he’s gay. And there was a chance to kind of discuss that and dissect it as I played because, you know, like, here you have a gay character that you only meet once. But, you know, there’s an opportunity for you, playing as Geralt, to kind of react one of two ways to finding out what he means when he says “I’m a freak.” And, you know, it was a chance to discuss the trope that was used and everything else, so there are things like The Witcher, things like BioWare games, where that narrative-driven focus gives you more opportunity for discussion. And, you know, thinking about it when you’re streaming. And sometimes I just like to play them offline, like, I just wanna go romance every once in awhile and not have it be on-cam, or on-screen. AO: Wonderful. I have one more question for you. And this, again, we’ve kind of, like, talked about it all. But, you know, once in awhile I get people come up to me and ask “How can I support diversity initiatives in games?” A lot of these people are not necessarily gamers. They may be just, like, you know, someone who comes into the Games Institute and is interested in games research, and they’re from another industry or field, and, you know, they hear about stuff that happens to, you know, women and people of colour in the games industry, and they’re like,”Oh my god,” like, “What can I do?” What would you say to those people? TD: I would see who’s doing the work out there, see who has a Patreon, or see if you can do a one-time donation. Think about sponsoring someone, if you have the money, to go to something like PAX, or GaymerX, or Flame Con, or Haven Con, where a lot of times it’s an issue of access. Because a lot of people that would like to go sometimes either can’t get the ticket, or the travel’s a bit much. Or do something where, you know, if you have the means to do it, you know, support monetarily. If you don’t have the means to do it, then signal boost. Follow folks on Twitter; follow their work. If you see an article, share it. But don’t just sit on the sidelines. Or if you’re playing a game and you see something that is not right–it’s a trope, it’s a stereotype–discuss it. And, you know–this is very important–find that balance between, “As a gamer, this bothers me; this is a trope,” or whatever, and speaking over people of colour, over LGBT folks, and remembering we’re not all a monolith. Something that may bother another Black person may not bother me at all. And, you know, that’s just how it is. We are not a monolith, but, you know, learn when to stay in your lane, as the saying goes. Because while it is great to speak up, sometimes you can wind up overtalking people as someone who wants to be an ally. So just think about, you know, should I say this? If I should say this, let me make sure that I’m not overtalking someone else. And make sure no one else has talked about it who is in more of a position of authority to speak from. Let’s say there’s a bad trope about Black people in a game, and you’re not Black, but it still bothers you. Boost what other people are saying instead of re-kind-of-inventing the wheel and talking about it, because as well-meaning as that is, it’s still not going to affect you the same way it will affect a Black person. So just kind of think about, where are you coming from? What is your motivation? What is it you’re doing? But signal boost at the very least, and if you can support monetarily, that is one of the best ways you can do it. And if you work at a studio, and can kind of get the ear of someone who can make decisions, something like that, go “Have you seen this work? Have you seen this article? Have you seen what these folks are doing? Is there a way we can support them more officially?” Or unofficially, and go, “Here’s a one-time donation,” or something. AO: Yeah, those are–and lots of good stuff there, lots of good messages to take away, and we’re definitely going to put some links in the post of this episode–you know, your Patreon and things like that, so people can have really easy access. So, we’re even doing some of the work for you! You know, just click the link! So, yeah, definitely lots of stuff, a lot of things for people to think about going forward after this episode. And I really appreciate you taking the time to talk with me, because this is important for everybody. And, you know, having a lot of academic, you know, readers. Not something that we often think about, or something that we put to the side when we think about our own work and our own careers. So it’s so, so important to have you on here. TD: Thank you so much, and I’ve been a big fan of First Person Scholar for a while, so I’m really happy and excited that you asked me to hang out and chat for a bit.